The Russian prime minister noted that Sergei Magnitsky “never fought corruption; he was just a corporate accountant and lawyer who was serving his boss.” Source: Dmitry Astakhov / RIA Novosti. Russian Prime Minister Dmitry Medvedev, in an interview with CNN, discussed the two countries’ divergent positions on issues such as the Magnitsky Act, the adoption ban, missile defense, and Syria. Experts believe Medvedev’s comments on the Magnitsky affair and the adoption ban were an attempt to justify the contested adoption law. Russia’s Prime Minister Dmitry Medvedev believes that the U.S. Congress made a mistake when, together with the abolition of the Jackson–Vanik amendment, it adopted the Magnitsky Act. Signed into law by President Obama at the end of 2012, the Magnitsky Act bans Russian officials suspected of involvement in the 2009 prison death of lawyer Sergei Magnitsky from entering the United States. Magnitsky, who worked for Bill Browder’s Hermitage Capital fund, claimed to have discovered that certain Russian Interior Ministry and tax officials had defrauded the Russian treasury of $230 million. No investigation followed Magnitsky’s allegations. “A whole group of people – I don’t know if they were involved or not – has been labeled criminals. 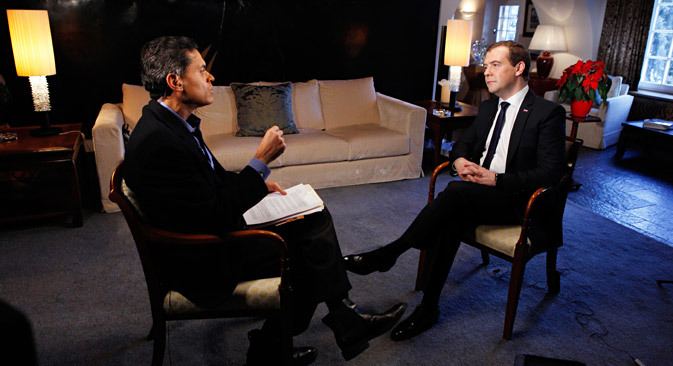 But what about the presumption of innocence?” said Medvedev in an interview with CNN. “So, in this situation, the Russian parliament had to respond,” Medvedev said, commenting on the reaction of the Russian Ministry of Foreign Affairs, which compiled a black list of its own that includes the names of 71 U.S. citizens accused by Moscow of violating the rights of Russian citizens. Economist Mikhail Khazin, president of the Neocon consulting company, noted that large market players always maintain informal relations with government bodies everywhere. “This whole story is a typical example of a sophisticated corruption scheme that is also standard; and, thus, all of this has zero relevance for investors,” Khazin said. “Everybody understands perfectly well that Browder wasn’t acting in a totally correct manner; for example, he was able to purchase Gazprom shares at a time when the ring fence prohibited it. Then he fell out with somebody,” said Khazin. At the same time, the prime minister noted that many foreigners do adopt Russian orphans with health problems. Head of the Moscow Helsinki Group, Lyudmila Alexeyeva, commented on Medvedev’s remarks by saying that they were an attempt to justify the law after the severe reaction it caused among the Russian and international public. “At first, they openly said it was a response to the Magnitsky Act. Now they are looking for ways to justify it after finding out that the law had triggered an unexpectedly stormy reaction both inside Russia and abroad,” Alexeyeva said. Political observer Alexey Makarkin, first vice president of the Center for Political Technologies, also believes that Medvedev is trying to justify the scandalous law in front of the Western audience. “The Americans passed a law aimed at corrupt officials, and we responded with a ban on adoptions. While this might work for the Russian audience, it’s unlikely to work abroad,” said Makarkin. Besides international adoptions, Russian-American relations are far from rosy in other areas too. In particular, Medvedev noted the lack of flexibility on missile defense. The prime minister also told CNN that Russia would like to see the sides of the Syrian conflict at the negotiating table. “We can under no circumstances allow a situation whereby the current political elite would be ousted as a result of armed actions,” Medvedev said.